High purity Chlorine Dioxide (CIO2) is the ideal product for treating liquid, surface and/or airborne microbial contamination in a safe and effective manner. Chlorine Dioxide, when it was originally discovered in 1811, was not successful in industrial applications and (drinking) water treatment, despite its superior disinfection capacities. The main reasons for the lack of success were the physical chemical properties of the product. Chlorine Dioxide had to be produced on the spot, was an unstable and explosive gas and also generated many byproducts, including Chlorite and free chlorine. CleanOxide™, however, overcomes these issues. 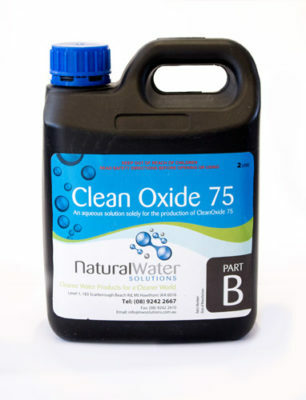 CleanOxide™ Liquid 75 is perfect for industrial and commercial use because it involves the production of a pure chlorine dioxide solution in water through the reaction of two stable liquids. Because the Chlorine Dioxide is practically pure (99.9%), there are no by-products such as free chlorine and Chlorite and because it is transported and stored as two separate chemicals, as well as created in water, there is no risk of explosion. To order or learn more about CleanOxide™ Liquid 75, please get in touch.